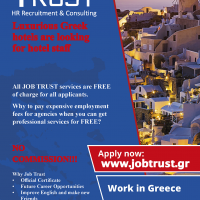 Job Trust is looking for staff at 4 * and 5 * hotels in Greece: waiters, cooks, chambermaids, dishwashers, drivers, security, bellboys, gardeners, receptionists, spa therapists, animators and other tourism specialists. NO COMMISSION to the agency! 3-8 months Working contracts from April to October. We pay salary, food, accommodation, tickets and support during your stay in Greece. 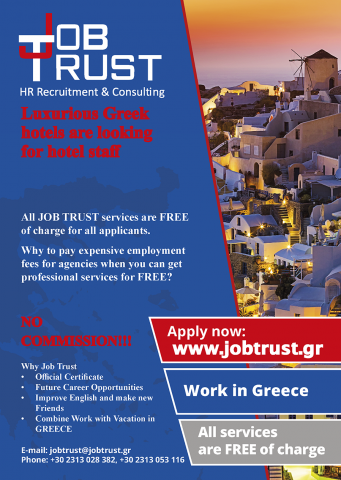 Apply NOW at www.jobtrust.gr! After you created your online CV call us on SKYPE (name: jobtrust & it appears as INTERVIEW WITH JOB TRUST) or VIBER ( phone: +30 698 824 88 50); any time from Monday to Friday between 9.00 and 17.00 o'clock (GREEK local time).